Laura Mulvey is best known for her essay, “Visual Pleasure and Narrative Cinema” which later appeared in a collection of her essays entitled Visual and Other Pleasures, and number of other anthologies. The article today regarded as one of the most important contributions to the area of film studies, shifting the orientation of the field. She has also co-written and co-directed six projects with Peter Wollen. She is a professor of Film and Media Studies at Birkbeck College in London. 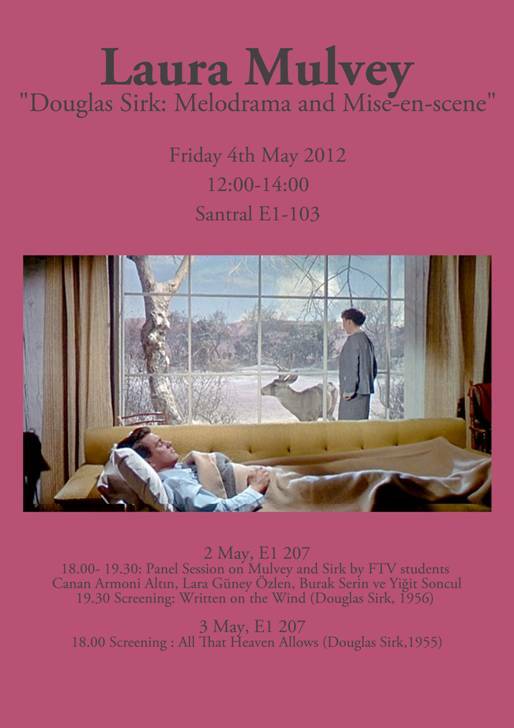 In this talk, Laura Mulvey will begin by placing Douglas Sirk’s 1950s melodramas within the context of his career in general and then within the context of their later critical reception. She will then focus more closely on the significance of his films for feminist film theory, particularly in relation to the aesthetics of melodrama and the woman’s film. Finally she will discuss the opening sequence of Sirk’s 1959 film Imitation of Life and its contribution to her recent thoughts on stillness in the moving image.